Anyway, as much as I think that this book is beautiful, I have a problem with using stamps and stencils made commercially or by other people and calling the art mine. I mean, I realize that I’m making the choices to put this together in my own particular way, but it violates my obsessive compulsive rules. My very “one”-ness tut-tuts this away as “very nice, but it ain’t art.” This bugs me a bit, because I’ve really tried to loosen up. All my rules had me very tightly wound. If I let myself, I could really go to extremes – where could it end? 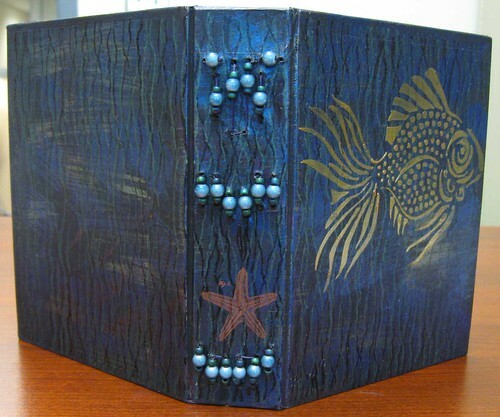 Would I have to make the paper, the bookboard, spin the linen thread, make the glass beads? Grow the flax for the linen? Gather dyes and pigments for the paint? Despite all the neurotic OC thoughts, I had fun with it and Chrissie’s method of binding will be extremely useful to me in recycling and binding old books in a new life as journals and sketchbooks. The other class I took was from Traci Bunkers, whose style is closer to my own. But I want to save that for its own post, with photos of the cover of that book. First I want to pimp up the spine with some beads and stuff. I am so excited over this new technique. It has helped me get over the funk that another instructor left me in. He was there. Do you remember that scene in Animal House when Boon and Otter go into the roadhouse and yell “Hey, Otis! My man!” at the band, and the singer gives him a look like WTF are you? Yeah. Whatever. There are other teachers, and he’ll get old one day like everybody else. I went to Ed McKay’s both nights since I’ve been back and raided the free shelf, this time looking more for the condition and size of the covers as well as content inside. Tonight I scored a bunch of National Geographics for collage. I didn’t find as many maps as I’d hoped, but it’s enough to keep me really happy and busy for a long time.